National Oilwell Varco, Inc., HollyFrontier Corp., and Core Laboratories N.V. are all disliked investments right now. But three of our top energy experts see things quite differently than Mr. Market. Plenty of energy stocks have been beaten up quite badly over the past several years. And with oil and natural gas prices still down more than half, there's good reason to avoid many companies in the sector. But that doesn't mean you should avoid every stock in the energy industry. As a matter of fact, three of our top energy contributors think now is a great time to take a closer look at three stocks Wall Street continues to hate: oil-field equipment maker National Oilwell Varco, Inc. (NYSE:NOV), refiner HollyFrontier (NYSE:HFC), and core and fluid analysis leader Core Laboratories N.V. (NYSE:CLB). Keep reading to learn why our energy experts think these three stocks deserve a little love right now. Matt DiLallo (National Oilwell Varco): Analysts aren't very fond of oil-field equipment maker National Oilwell Varco. In fact, roughly 85% of the analysts that cover the stock currently rate it a hold or underperform. The reason most don't like the company right now is that some of its markets continue to be under pressure as the oil market downturn winds down. Offshore is weak for NOV, but onshore orders have grown. Image source: Getty Images. That said, National Oilwell Varco seemed to turn the corner last quarter after its revenue not only stopped declining for the first time since late 2014 but rose 3%. Meanwhile, its net loss narrowed a bit as a result of higher sales and improving margins and was much less than analysts feared. Driving the improvement was "sharply rising demand in North America" due to growth in shale production. Because of that, its revenue from land markets exceeded offshore sales for the first time in years. While international and offshore markets remain challenging, the company anticipates they will start turning around soon. Meanwhile, it expects sales to North American land customers to continue heating up. Because of that, it is optimistic about 2017. That expectation for improvement, along with its market-leading position and strong balance sheet, is all the more reason to love this stock, which has the potential to deliver significant gains in 2017 as the oil market recovery takes hold. Tyler Crowe (HollyFrontier): The oil refining business has fallen out of favor as of late, and the reasons why are wildly apparent. Higher-than-average inventory levels of gasoline and diesel combined with volatile crude oil prices are making refining margins uncommonly thin. On top of that, compliance costs for the U.S. EPA's renewable fuels standards were extremely high and sapped profits for the entire industry. With that industry backdrop, it's easy to see why Wall Street isn't that interested in HollyFrontier's stock. Effective capital allocation keeps HollyFrontier in a great position. Image source: Getty Images. That less-than-optimistic outlook overlooks the fact the HollyFrontier is a fantastic capital allocator, and its most recent acquisition is proof. In October 2016, HollyFrontier purchased a 15,000-barrels-per-day lubricants manufacturing facility from Suncor Energy for a total price of $845 million -- $587 million if you don't count working capital items like inventories. This lubricants facility is important because it is the only lubricants facility in North America that makes what are called Group III base oils. These are a higher-grade oil that improve engine efficiency and longevity, and are getting used more often in the automotive industry. The benefit for HollyFrontier is that the average benchmark profit margin for Group II base oils is $120 per barrel, more than 10 times the realized refining margin for fuels today. According to management, this lubricants facility will generate $100 million-$200 million in annual EBITDA, with an expected $150 million in a normal refining environment. So, based on the purchase price, HollyFrontier bought this facility for a valuation of 2.9-5.8 times annual EBITDA (net working capital). That's a steal by almost any valuation metric, and is one example of why HollyFrontier has consistently produced one of the highest returns on invested capital in the oil refining industry. In such an up and down industry, you want a management team that is going to smartly deploy capital when the time is right, and HollyFrontier continues to demonstrate this year in, year out. Jason Hall (Core Laboratories N.V.): With 13% of its shares sold short at this writing, Core Lab clearly has a lot of money betting against its success -- at least in the near term. And by a lot of traditional metrics, it's easy to see it as overvalued, with shares trading for 75 times last year's earnings and over 52 times next year's estimates. Yet I couldn't think of a worst time to be short Core Lab than right now, and especially based on the stock being overvalued. Here's why. To start, Core isn't much like many other companies in oil and gas. It doesn't own much in the way of expensive equipment that requires fixed costs that have been a drag on so many other companies in the industry during the downturn, instead relying on its industry-leading proprietary technology to help oil and gas producers produce more efficiently and at lower recovery costs. This brings us to the second thing Core Lab's business model does: It puts the company in a very enviable position when the market does recover. Since it doesn't rely on "picks and shovels" to run its business, it is perfectly positioned to profit from increased demand for its services. And the recovery has started. In its most recent quarter, Core Lab reported sequential growth in sales, and management said that it believes its fiscal third quarter was the bottom of the cycle. 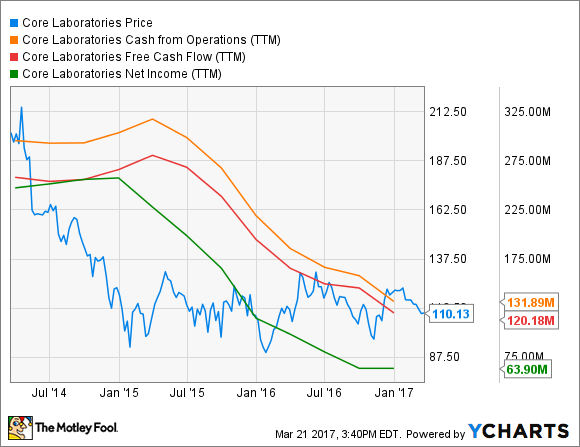 Considering that the company's biggest strength is helping producers improve their well economics, now is an ideal time to be buying Core Lab, not selling or shorting it.